Spreading Love and Joy everywhere we go! When you book an Opp Art Box for your special event, you get more than a photo station. 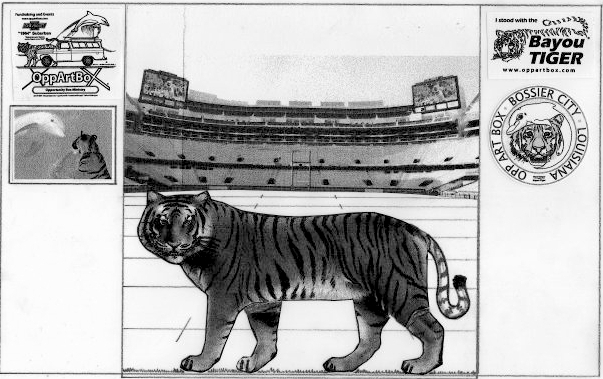 The Bayou Tiger Box includes a life size tiger backed by a football stadium and set on astroturf that is delivered in a box ready for your guests to enjoy. The box is delivered directly to your event and set up for you. It is near impossible for your guests to resist stepping onto the box for their photo opportunity with their friends and family. Contact Us today to discuss bringing your event to life with an OPP ART BOX! BOOK YOUR OPP ART BOX TODAY! WHICH BOX WILL YOU CHOOSE?